Leanne O’Sullivan was born in 1983, and comes from the Beara peninsula in West Cork. She received an MA in English in 2006 from University College, Cork, where she now teaches. 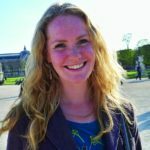 The winner of several of Ireland’s poetry competitions in her early 20s (including the Seacat, Davoren Hanna and RTE Rattlebag Poetry Slam), she has published four collections, all from Bloodaxe, Waiting for My Clothes (2004), Cailleach: The Hag of Beara (2009), winner of the Rooney Prize for Irish Literature in 2010, The Mining Road (2013) and A Quarter of an Hour (2018). She was given the Ireland Chair of Poetry Bursary Award in 2009 and the Lawrence O’Shaughnessy Award for Irish Poetry in 2011, and received a UCC Alumni Award in 2012. Her work has been included in various anthologies, including Selina Guinness’s The New Irish Poets (Bloodaxe Books, 2004) and Billy Collins’s Poetry 180: A Turning Back to Poetry (Random House, 2003). Residencies and festival readings have taken her to France, India, China and America, amongst other locations.